CAMBRIDGE, Mass. -- Nearly 13.7 billion years ago, the universe was made of only hydrogen, helium and traces of lithium — byproducts of the Big Bang. Some 300 million years later, the very first stars emerged, creating additional chemical elements throughout the universe. Since then, giant stellar explosions, or supernovas, have given rise to carbon, oxygen, iron and the rest of the 94 naturally occurring elements of the periodic table. "We want to understand the evolution of tellurium — and by extension any other element — from the Big Bang to today," says Anna Frebel, an assistant professor of astrophysics at MIT and a co-author on the paper. "Here on Earth, everything's made from carbon and various other elements, and we want to understand how tellurium on Earth came about." The team analyzed the chemical composition of three bright stars located a few thousand light-years away, "in the halo of the Milky Way," Frebel says. The researchers looked at data obtained from the Hubble Space Telescope's spectrograph, an instrument that splits light from a star into a spectrum of wavelengths. If an element is present in a star, the atoms of that element absorb starlight at specific wavelengths; scientists can observe this absorption as dips in the spectrograph's data. 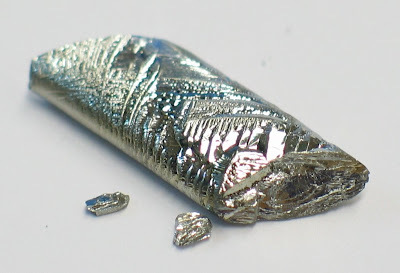 Frebel and her colleagues detected dips in the ultraviolet region of the spectrum — at a wavelength that matched tellurium's natural light absorption — providing evidence that the rare Earth element does indeed exist in space, and was likely created more than 12 billion years ago, at the time when all three stars formed. Frebel's team found that the ratios of heavy elements observed in the three stars matched the ratios predicted by these theoretical models. The findings, she says, confirm the theory that heavier elements likely formed from a rare, extremely rapid supernova. "You can make iron and nickel in any ordinary supernova, anywhere in the universe," Frebel says. "But these heavy elements seem to only be made in specialized supernovas. Adding more elements to the observed elemental patterns will help us understand the astrophysical and environmental conditions needed for this process to operate." "There are still quite a few holes," Frebel says. "Every now and then, we can add an element, and it adds another data point that makes our work easier." Paper: "Detection of the second r-process peak element Tellurium in metal-poor stars"